looks okay i guess… but still, in the end it’s just a DS that has been souped up a _little_ bit, right? herly: The link you provided seems contain potential malware, so I removed the it. (I’m sorry) If you can find the video hosted on a legit site, please post it. Seb: Which was exactly my point. 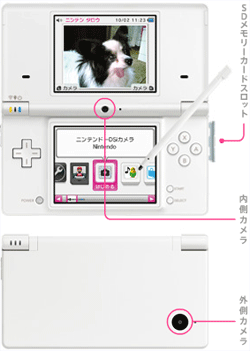 IMO, the DSi is all about milking a little more from an already dead console. But that’s ok if you’re selling an experience more than a piece of hardware, I guess. But it won’t make sound software and emulators run better if you know what I mean. I’m happy with this. It was just time for a DS revision and to cover another Japanese launch day. I don’t think it’s underpowered at all. Just don’t try to do stuff that requires power. I tend to find that stuff ugly even if it’s pulled out decently. What do you mean by this? For example, the DS is struggling to emulate a SNES, whereas the PSP emulates a SNES perfectly, and can almost emulate a DS. Sometimes a lack of CPU power can be a problem. CPU power isn’t everything, but it isn’t unimportant either. I have a DS, but no PSP, and I mainly use it for music software. Music software is using a lot of CPU, which is why that was my personal wish. They are not looking bad, but fact is still that they could look better with stronger hardware. I don’t know if you watched it, but during the conference when N presented the DSi, they said that it is meant to be a “third platform”, not meant to compete with the original DS’s. So it looks like that’s what they actually had in mind. It helps to have more RAM, but it cannot replace a better CPU or GPU. That comment doesn’t even make sense on any level. As for your Google query, no it (still) only has 1 touch screen. Maybe a psp killer, but not a psp GO killer. Nitro said it the best. This page was previously hosted on http://gameboygenius.8bitcollective.com/wordpress/2008/10/02/nintendo-announces-dsi-the-next-generation-nds/ (*).